Soundline is a playful, social, sonic intervention which aims to investigate the potential for technology to influence the future of entertainment and the facilitation of the state of group flow within these spaces. Turning an “error” within the festival experience, into an opportunity for play and creative exploration, this roaming performance creates an environment that invites audiences to engage through music, dance and performance. This project was designed so that anyone, regardless of musical proficiency, could contribute to a soundscape in a way that was still pleasant to listen to and felt as valid as the most skilled musical artist. In interacting with this project audience members become co-collaborators through play with five abstracted musical instruments in the form of orbs. Each orb is used to control a single track within a larger soundscape. This is achieved through the use of inertial movement sensors housed within each orb. These sensors read the rotational information conveyed through the user’s manipulation of the orb and convey this data to a synthesiser. When the actions of several participants are brought together the collaborative actions of the participants creates something greater than any one individual’s actions. in order to manifest changes in song composition such as melody, arpeggios or rhythm, audience members are initiated into understanding the orbs musical parameters through physical manipulation. Once these parameters are understood the opportunity for their own musical creativity emerges. Within a Soundline performance at least one dancer accompanies an orb and embodies its musical characteristics. During the performance dancers act as educators teaching by example before attempting to hand off the orb to willing participants. 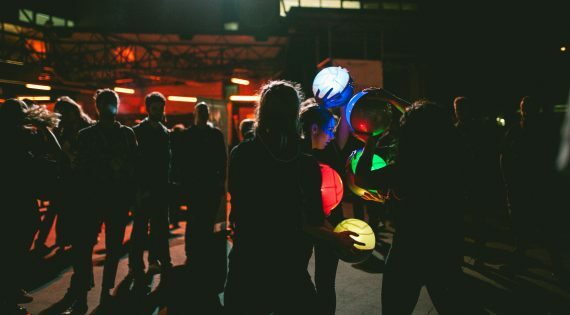 Once an audience member is at the stage where they are ready to play and create their own contribution, they are also able to influence the movements of the dancers, depending on how they move the orb and the resulting sounds. Because of the physicality presented by the orb to dancer relationship, participants begin to bring their own movement into the performance, exploring the relationship between their movement the resulting sound and the opportunity for creative expression with both the dancer and soundscape. As this project is conducted in public spaces with multiple audience members taking part within each performance, audiences learn from observation and the barriers that may hinder them from initial engagement or participation within the performance can be reduced.